A fine flatware collection is not complete without a beautiful set of steak knives. There’s no better way to enjoy a perfectly cooked fillet mignon or juicy porterhouse, than with high-quality steak knives from Wusthoff, J.A. Henckels and Alfi International. 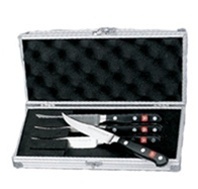 Our knife sets are the perfect gift for the steak-lover in your life!